You are here:HomeBlog[CASP]: Chinari Kindergarten Receives Christmas Gift from CASP. [CASP]: Chinari Kindergarten Receives Christmas Gift from CASP. FAR’s periodic interventions in the Shamshadin region of Tavush help a population that suffers greatly from social and economic hardship. 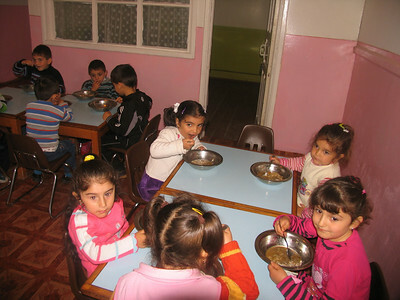 In the most recent development, the Children of Armenia Sponsorship Program (CASP) has made it possible for children in the area’s school to receive healthy and nutritious lunches. This region has had its share of tragedy, as it is situated along the longest frontier with neighboring Azerbaijan and many villagers have been killed in skirmishes over the years. Meanwhile, many members of the younger generation have left the area in search of jobs and greater stability. The village of Chinari is located in the easternmost settlement of Shamshadin. Here there is one kindergarten with 25 children, which was established in 1942. Before a new building was constructed in 1990, the school was previously located in several private homes. Over the years, it has been temporarily closed time and again due to Azeri shelling. Its walls are pocket-marked by Azeri bullets. “When the Azeris open fire I gather the children in this one room for shelter. I close the door and turn up the music so that they won’t hear the shots and get afraid. I’m the one who is most afraid, but not for myself. I’m afraid for the little ones. I’m responsible for their safety. Until they all return home safe and sound, I don’t rest,” says the Principal Aghasyan. The most serious problem the kindergarten faces today is proving nutritious and adequate meals to children. Lack of adequate financial resources make it hard to ensure healthy, balanced meals for the kindergarten’s children. But recently, funds raised through the Children of Armenia Sponsorship Program (CASP) Advent by Candlelight Program will fund nutritious meals for 25 children at Chinari kindergarten, beginning this week. On behalf of Chinari Kindergarten kids and families, FAR would like to express its thanks to the Women’s Guild Central Council of the Diocese of the Armenian Church of America (Eastern) for this benevolent initiative.